CD27 as a target for immunotherapy has been under investigation recently, such as the CDX-1127 (Celldex Therapeutics) monoclonal antibody. Recent phase I study (http://www.celldex.com/docs/ASCOPoster2014finalversion_Lymphoid-Malignancies.pdf) shows that complete response (CR) or stable disease (SD) has been achieved in patients with late-stage pre-treated lymphoma (CR on Hodgkin, and SD on non-Hodgkin and follicular). I did a quick look up of CD27 in Zodiac (www.compgenome.org/zodiac). See my blog here for an introduction of Zodiac. Typing CD27, CD70, PDCD1, CD274, I Zodiac-ed four genes, CD27 and CD70 (the receptor of CD27), and PDCD1 (PD-1) and its ligand CD274 (PD-L1). First, CD27 and its receptor CD70 is co-expressed in Zodiac. Also, there appears to be a co-expression between CD70 and PD-1, the well-known immune checkpoint gene. These results in Zodiac supports the current enthusiasm in using anti-CD27 in combination of PD-1 inhibitor as immunotherapy for cancer treatment. (see Figure below). 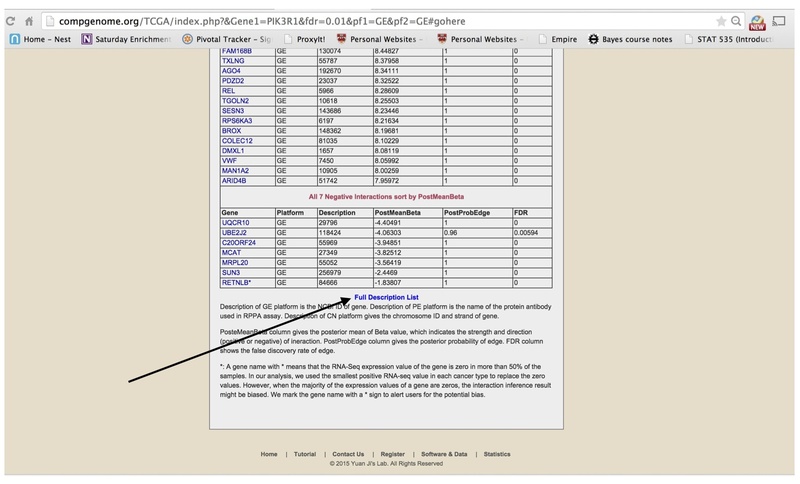 I then Zodiac-ed CD27 alone (http://compgenome.org/TCGA/index.php?&Gene1=CD27&fdr=0.01&pf1=GE&pf2=GE#gohere) and checked the top 20 genes that are co-expressed with CD27. Strikingly, 9 out of these 20 genes are related to T-cell biology, immunology, or blood biology. Most other genes do not have a known function. CXCR3 This gene encodes a G protein-coupled receptor with selectivity for three chemokines, termed CXCL9/Mig (monokine induced by interferon-g), CXCL10/IP10 (interferon-g-inducible 10 kDa protein) and CXCL11/I-TAC (interferon-inducible T cell a-chemoattractant). Binding of chemokines to this protein induces cellular responses that are involved in leukocyte traffic, most notably integrin activation, cytoskeletal changes and chemotactic migration. CD8B The CD8 antigen is a cell surface glycoprotein found on most cytotoxic T lymphocytes that mediates efficient cell-cell interactions within the immune system. The CD8 antigen, acting as a coreceptor, and the T-cell receptor on the T lymphocyte recognize antigens displayed by an antigen presenting cell (APC) in the context of class I MHC molecules. The functional coreceptor is either a homodimer composed of two alpha chains, or a heterodimer composed of one alpha and one beta chain. Both alpha and beta chains share significant homology to immunoglobulin variable light chains. GRAP2 This gene encodes a member of the GRB2/Sem5/Drk family. This member is an adaptor-like protein involved in leukocyte-specific protein-tyrosine kinase signaling. Like its related family member, GRB2-related adaptor protein (GRAP), this protein contains an SH2 domain flanked by two SH3 domains. This protein interacts with other proteins, such as GRB2-associated binding protein 1 (GAB1) and the SLP-76 leukocyte protein (LCP2), through its SH3 domains. C1QB This gene encodes a major constituent of the human complement subcomponent C1q. C1q associates with C1r and C1s in order to yield the first component of the serum complement system. Deficiency of C1q has been associated with lupus erythematosus and glomerulonephritis. C1q is composed of 18 polypeptide chains: six A-chains, six B-chains, and six C-chains. Each chain contains a collagen-like region located near the N terminus and a C-terminal globular region. The A-, B-, and C-chains are arranged in the order A-C-B on chromosome 1. GZMA Cytolytic T lymphocytes (CTL) and natural killer (NK) cells share the remarkable ability to recognize, bind, and lyse specific target cells. They are thought to protect their host by lysing cells bearing on their surface ‘nonself’ antigens, usually peptides or proteins resulting from infection by intracellular pathogens. The protein described here is a T cell- and natural killer cell-specific serine protease that may function as a common component necessary for lysis of target cells by cytotoxic T lymphocytes and natural killer cells. CD48 This gene encodes a member of the CD2 subfamily of immunoglobulin-like receptors which includes SLAM (signaling lymphocyte activation molecules) proteins. The encoded protein is found on the surface of lymphocytes and other immune cells, dendritic cells and endothelial cells, and participates in activation and differentiation pathways in these cells. The encoded protein does not have a transmembrane domain, however, but is held at the cell surface by a GPI anchor via a C-terminal domain which maybe cleaved to yield a soluble form of the receptor. TNFSF13B The protein encoded by this gene is a cytokine that belongs to the tumor necrosis factor (TNF) ligand family. This cytokine is a ligand for receptors TNFRSF13B/TACI, TNFRSF17/BCMA, and TNFRSF13C/BAFFR. This cytokine is expressed in B cell lineage cells, and acts as a potent B cell activator. It has been also shown to play an important role in the proliferation and differentiation of B cells. It is clear that CD27 interacts with many important genes related to immune cells, such as T-cells, leukocytes (white blood cells), and B-cells. Discoveries of the above from Zodiac could lead to future investigation of additional therapeutic targets. This is the 5th-article of a blog series aiming to introduce Zodiac, a comprehensive tool that reveals genetic interactions in cancer by big-data computation. An introduction of Zodiac is in the 1st article here. Large-scale cancer sequencing projects have identified PIK3R1 as one of the most commonly mutated genes across different tumors by Cheung et al. (2014). The authors also show the intricate relationship among PIK3R1, ERK (MAPK1), and JNK (MAPK8). An independent set of upstream mutations also exhibit oncogenic activity by altering stability of PTEN and by activating the MAPK pathway. The circos plot in Figure 1 shows the results from Zodiac (Zhu et al., 2015, http://www.compgenome.org/zodiac). It is obtained by typing the four gene names PIK3R1 MAPK1 MAPK8 PTEN in the Zodiac search bar. The plot shows that the GE (gene expression) of PIK3R1 positively connect with the GE of MAPK1 and MAPK8; the PE (protein expression) of PIK3R1 positively connects with the PE of PTEN. This confirms existing knowledge about PIK3R1. Typing PIK3R1 in Zodiac will return all the significant genetic interactions between any other genes and PIK3R1. Let’s take a look at the top 20 genes that positively connect with PIK3R1 in terms of GE-GE interaction. Side Note: We added a “Full Description List” button (see figure below) and clicking it you get all the NCBI descriptions of the top genes returned by Zodiac. GRM3 L-glutamate is the major excitatory neurotransmitter in the central nervous system and activates both ionotropic and metabotropic glutamate receptors. Glutamatergic neurotransmission is involved in most aspects of normal brain function and can be perturbed in many neuropathologic conditions. The metabotropic glutamate receptors are a family of G protein-coupled receptors, that have been divided into 3 groups on the basis of sequence homology, putative signal transduction mechanisms, and pharmacologic properties. Group I includes GRM1 and GRM5 and these receptors have been shown to activate phospholipase C. Group II includes GRM2 and GRM3 while Group III includes GRM4, GRM6, GRM7 and GRM8. Group II and III receptors are linked to the inhibition of the cyclic AMP cascade but differ in their agonist selectivities. Apparently, GRM3 is involved in most aspects of brain functions. Strikingly, in Zodiac, the beta-value of GRM3 and PIK3R1 is 21.01. This is a very large score as a score greater than 5 is usually considered large in our statistical model. It means there is a 21-fold incremental chance that the gene expression of GRM3 will be disrupted if the gene expression of PIK3R1 is disrupted. For example, a somatic mutation in PIK3R1 might alter its expression, which would highly likely alter the expression of GRM3. It has been known that PIK3R1 is known to be a potential drug target of glioblastoma (Weber et al., 2011). Having a strong interaction with GRM family might explain the mechanism of PIK3R1 in brain tumor development. Next I show a selected list of genes among the 20 ones that interact with PIK3R1. Apparently, these genes are important by just looking at their descriptions. N4BP2 This gene encodes a protein containing a polynucleotide kinase domain (PNK) near the N-terminal region, and a Small MutS Related (Smr) domain near the C-terminal region. The encoded protein can bind to both B-cell leukemia/lymphoma 3 (BCL-3) and neural precursor cell expressed, developmentally downregulated 4, (Nedd4) proteins. This protein binds and hydrolyzes ATP, may function as a 5′-polynucleotide kinase, and has the capacity to be a ubiquitylation substrate. This protein may play a role in transcription-coupled DNA repair or genetic recombination. RPS6KA3 This gene encodes a member of the RSK (ribosomal S6 kinase) family of serine/threonine kinases. This kinase contains 2 non-identical kinase catalytic domains and phosphorylates various substrates, including members of the mitogen-activated kinase (MAPK) signalling pathway. The activity of this protein has been implicated in controlling cell growth and differentiation. PDZD2 Proteins containing PDZ domains have been shown frequently to bind the C-termini of transmembrane receptors or ion channels. They have also been shown to bind to other PDZ domain proteins and could possibly be involved in intracellular signalling. The protein encoded by this gene contains six PDZ domains and shares sequence similarity with pro-interleukin-16 (pro-IL-16). Like pro-IL-16, the encoded protein localizes to the endoplasmic reticulum and is thought to be cleaved by a caspase to produce a secreted peptide containing two PDZ domains. In addition, this gene is upregulated in primary prostate tumors and may be involved in the early stages of prostate tumorigenesis. ARID4B This gene encodes a protein with sequence similarity to retinoblastoma-binding protein-1. The encoded protein is a subunit of the histone deacetylase-dependant SIN3A transcriptional corepressor complex, which functions in diverse cellular processes including proliferation, differentiation, apoptosis, oncogenesis, and cell fate determination. The gene product is recognized by IgG antibody isolated from a breast cancer patient and appears to be a molecular marker associated with a broad range of human malignancies. Lastly, let me end by pointing to the following three genes, DMXL1 SESN3 REL, which are all among the top 20 genes interacting with PIK3R1 in terms GE-GE. These genes are related to hematopoietic cell development, blood glucose, and proliferation of B lymphocytes. Therefore, PIK3R1 might also play a role in liquid cancer. This is the 4th-article of a blog series aiming to introduce Zodiac, a comprehensive tool that reveals genetic interactions in cancer by big-data computation. An introduction of Zodiac is in the 1st article here. Previously, I briefly introduced Zodiac and presented case 1 (here), case 2 (here), and case 3 (here). Case 4 is about gene fusion. A gene fusion refers to a genetic event where two previously separated genes on the genome are formed as a hybrid gene by rearrangement, such as translocation. The most well-known fusion gene is the Philadelphia chromosome, which involves reciprocal translocation between chromosome 9 and chromosome 22, which is specifically designated t(9;22)(q34;q11). This results in an ABL-BCR fusion gene, a hybrid gene formed by two separate genes, ABL1 and BCR. ABL-BCR gene fusion is frequently observed in chronic myelogenous leukemia (CML), and leads to the development of drug Gleevac in the late 1990’s and early 2000’s, as one of the first targeted cancer therapies. Since then, fusion genes have been haunted by scientists and their roles to diseases investigated. If two genes are fused, they act as one gene. Therefore, they are likely to be co-expressed (GE-GE interaction), co-copy-number-changed (CN-CN interaction), or co-methylated (ME-ME interaction). Since Zodiac provides information on all three types of interactions for any pairs of genes, it could lead to discoveries of novel gene fusions. Indeed, we have identified many and below is one example. 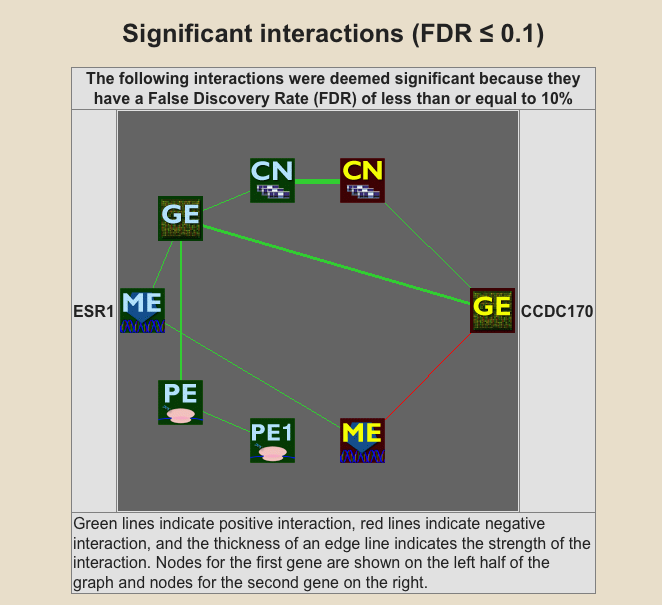 Zodiac shows significant positive edges between gene expressions (see figure below), copy numbers, and methylations of ESR1 and CCDC170. A recent study published in Nature Communications (Veeraraghavan et al., 2014) identifies recurrent rearrangements between the oestrogen receptor gene ESR1 and its neighbour CCDC170, which are enriched in the more aggressive and endocrine-resistant luminal B tumours. This fusion encodes amino-terminally truncated CCDC170 proteins (CCDC170), which in ER+ breast cancer cells leads to markedly increased cell motility and anchorage-independent growth, reduced endocrine sensitivity and enhanced xenograft tumour formation. Mechanistic studies suggest that CCDC170 engages Gab1 signalosome to potentiate growth factor signalling and enhance cell motility. As to the famous ABL-BCR gene fusion, well, Zodiac also shows that the two genes have positive GE-GE and ME-ME edges, but with no CN-CN edge. This is only weak evidence supporting potential gene fusion events. Recall that Zodiac is based on analysis of 1,400+ samples across 11 cancer types in TCGA that do not include CML, and that ABL-BCR gene fusion is frequently seen in CML, this lack of evidence might not be a surprise. In summary, looking for co-occurrence of GE-GE, CN-CN, ME-ME edges between a pair of genes in Zodiac might reveal novel gene fusion candidates in cancer. This is the 2nd-article of a blog series aiming to introduce Zodiac, a comprehensive tool that reveals genetic interactions in cancer by big-data computation. An introduction of Zodiac is in the 1st article here. A novel therapeutic strategy that tackles a critical immune-modulating mechanism has recently risen to the forefront of cancer immunotherapy: the blockade of the inhibitory receptors cytotoxic T-lymphocyte–associated antigen 4 (CTLA4), programmed death-1 (PD1, or PDCD1) and its ligand, PDL1 (CD274), an approach termed immune-checkpoint blockade. This treatment is designed to improve activation and effector function of tumor-specific T cells. Zodiac shows that the expression of CTLA4 is strongly correlated with the expressions of genes related to immune cells and system, such as TCL1A, CD38, IKZF1, LYN, LAMP3, and CD5. See here. For PD1, Zodiac shows strong co-expression of important genes such as PTPN7, CD6, and many other interesting cancer-related genes. See here. For PDL1, the list of co-expressed gene is equally intriguing, see here. Genes such as TP63, PI3KCG are positively correlated while TGFB1L1 (HIC5) and MME are negatively correlated. Lastly, the three genes exhibit cross modality interactions (see here) in Zodiac, suggesting potential interplay among them in the cellular systems. I hope these results will accelerate the discovery of new cancer immunotherapies by providing potential new drug targets. 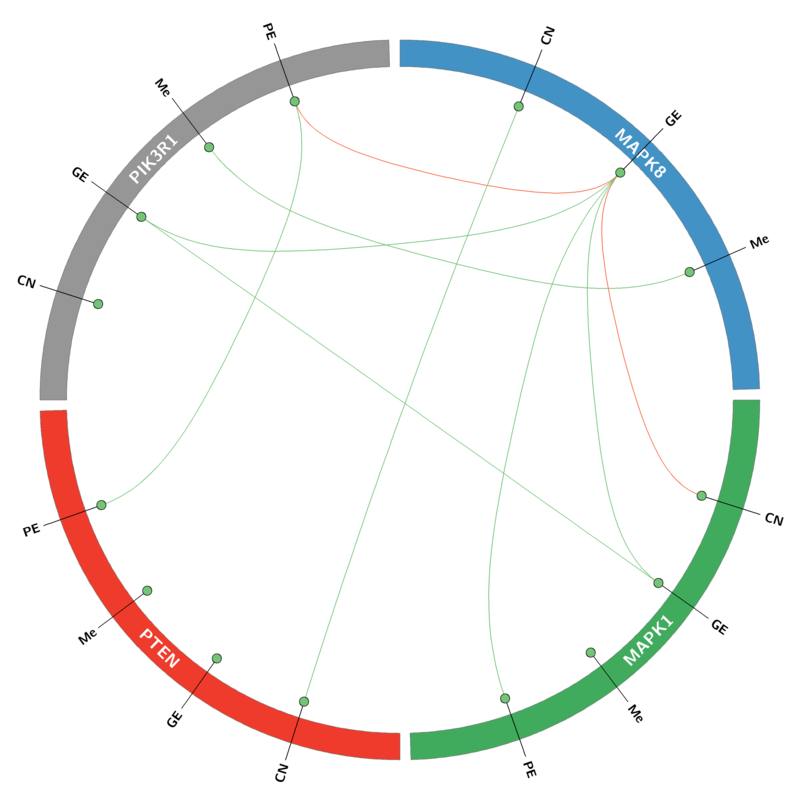 This is the 1st-article of a blog series aiming to introduce Zodiac, a comprehensive tool that reveals genetic interactions in cancer by big-data computation. This is a short series introducing our new work, Zodiac (Zhu et al., 2015, JNCI), an online resource for genetic interactions in Cancer. It is a paper coming out in the August 2015 issue of the Journal of National Cancer Institute. Zodiac is a big-data computational project involving complex statistical modeling, massively parallel computation, and user-friendly interface building. It is built by an amazing inter-disciplinary team of statisticians, computational scientists, and biologists. I will provide a series of use cases for Zodiac. The goal is to invite comments, critiques, and discussions on genetic interactions in cancer. Zodiac performed such updates for 200 million pairs of genes and produced a new online database. Equally important, Zodiac provides tools that allow users to choose which knowledge they want to update. The main interface is a search bar (like google search) in which users type genes names of interests. Depending on if one, two, or multiple gene names are provided, Zodiac returns results graphically in different formats, but all containing a genetic network regarding the genes searched. See Figure below. These networks are computational results based on the posterior interaction map using BGM aforementioned. Zodiac can be formally used to validate existing knowledge about genetic interactions and hypothesize new interactions for future research. It is comprehensive in the sense that any genes measured in the TCGA data are included. We have found Zodiac handy in occasional usage, including during a seminar (for live query of new genetic interactions being presented), literature review (for query of published new knowledge about genetic interactions), and scientific meetings between collaborators. Since it is accessible anywhere on any devices with internet access, such usage makes Zodiac attractive for spontaneous occasions like these. A recent publication in The New England Journal of Medicine (A.C. Antoniou et al., 2014) shows that the loss-of-function mutations in PALB2 are an important cause of hereditary breast cancer, with respect both to the frequency of cancer-predisposing mutations and to the risk associated with them. The study suggests that the breast-cancer risk for PALB2 mutation carriers may overlap with that for BRCA2 mutation carriers. PALB2 (partner and localizer of BRCA2) was originally identified as a BRCA2-interacting protein that is crucial for key BRCA2 genome caretaker functions; it was subsequently also shown to interact with BRCA1.